There are few New Media Institute projects that are fully developed, funded and released in the Apple iTunes tore. There are even fewer NMI projects that have such specialized technology that they are sought by international researchers. 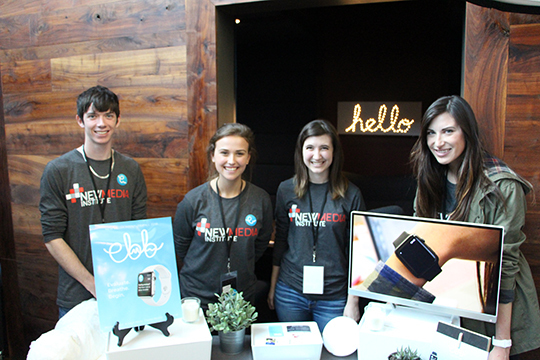 The Ebb app team included Joe Reisigl (ABJ ’16), Clarke Modlin (ABJ ’17), Madison Hall (AB ’17) and Kristyn Hicks (ABJ ’17). The Ebb app, a fall 2016 NMI capstone project developed by a group of Grady College students, is one of those rare projects. Ebb was a back-up project for the NMI capstone team that included Kristyn Hicks (ABJ ’17), Madison Hall (AB ’17), Clarke Modlin (ABJ ’17) and Reisigl. When the first project that the team had spent several weeks developing fell through, the team had to scramble to come up with a new idea to summarize their NMI education. Based on a suggestion that Hall had, the team turned to the development of the Ebb app. Ebb is short for Evaluate, Breathe, Begin. The Ebb app is used to monitor heart rates that are caused by spikes in anxiety. When the app, which is most functional on an Apple Watch, detects the jump in heart rate, it sends a message to the user suggesting exercises that can be done for a temporary fix including yoga, meditation and spatial recognition. It also includes a feature to journal about the experience so patterns can be detected for the future. The principle developer on the project was Reisigl, who ironically, didn’t own any Apple products and just recently learned the Swift coding used in Apple apps. Reisigl discovered his interest in coding through his coursework at Grady with Bart Wojdynski and Chris Gerlach. Emuel Aldridge, a senior lecturer at NMI and the team’s advisor watched the process come together through Reisigl’s coding. The app was first presented in a beta format at the fall 2016 NMI SLAM showcase and by February is was officially launched on the Apple iTunes store. There have been a few forms of validation along the way. First there was the Atlanta-area psychologist who reached out to the team because she works with patients with anxiety and stress. She said she recommends the app to clients because it suggests some of the same exercises that she recommends to her clients. The other source of validation came from Japan. Shortly after the official launch, Aldridge was contacted by Jim Moore, a professor of large animal medicine at the College of Veterinary Medicine at UGA. Moore also works in developing interactive 3-D teaching materials and had attended an Apple Educators meeting in Berlin where he heard a Japanese researcher talk about his work. The researcher, Takahiro Uchida, was working on methods to help severely handicapped students. Specifically, he was trying to determine when the students were engaged in the classroom, but since they could not speak, their engagement was difficult to determine. Uchida described a complicated way he had been monitoring their heart rate, and when Moore heard the many steps and rudimentary way he was doing that, he suggested someone at UGA might be able to help make it easier and more convenient. Moore approached Aldridge who was put in touch with Reisigl. Moore, who said he was pleasantly surprised that this technology came from a student team, said the project has been a success. “Dr. Uchida is extremely pleased, and now is seeking additional help to make the process even easier so other teachers can use it,” Moore said. This is one of three apps created by NMI students that have reached the consumer market. An app of UGA stickers that can be added to social media messages was developed last spring, and in October of this year, an app called “Film Norcross” was developed, identifying key movie locations in Norcross.